A few weeks ago the lovely ladies at Mox Shoes, Amber and Stacey, contacted us and asked if we would like to try a pair of their comfy ballet flats. As you can guess, we were intrigued and let's be honest, you don't have to say "free shoes" more than once to get our attention. After checking out their website we were practically jumping up and down with excitement. The concept of these shoes was fantastic. They are a rubber ballet flat (think the material that a rubber flip-flop is made out of) in a cute basket weave design. It makes them the anywhere shoe that can literally take you from the pool to a party and everything in between. We each took a look at their site, checked out the sizing guide and picked our colors. When they arrived we were just gitty and couldn't wait to start wearing them. Read below to see each of our thoughts about Mox Shoes and make sure you keep reading all the way to the bottom of the post for a special discount for our readers! I had a hard time deciding on a color because honestly, I loved them all. Ultimately, I went with Latte and decided a good neutral would match just about anything. I loved their tag line "comfort beyond the flip-flop" because that is so me. I live in flip-flops when it is warm and I am definitely all about comfort when it comes to shoes. There used to be a time when I would choose cute over comfort, but those days are far and few between now. You would think that a ballet flat would be a no-brainer in the way of comfort, but that is not the case for me. I actually have a hard time wearing ballet flats because they usually just don't offer me enough support and after a few hours my feet are killing me. I was hopeful that these would be a little different than most and they certainly are. The first time I wore them was on Easter. I wore heels to church, but changed into these right after we got home and wore them the rest of the day. I was so pleasantly surprised that my feet felt just as good when I took them off that night as they did when I put them on. They stood up to a busy day of egg hunting and celebrating a holiday with family. Since that day, they became a favorite go-to shoe not only because of the comfort but also because of their versatility. I can wear my Mox shoes with anything. They look great with skirts and dresses, but are also cute with shorts and my skinny jeans. Because the weave design is breathable, I really see wearing these year round. They will be perfect in the summer, but because my feet are always hot, I will wear them into fall, too. Bottom line is, I love these shoes. I love them even more than I thought I would and I would DEFINITELY recommend them to anyone. Seriously, y'all need to order yourself a pair and give them a try. I promise you will thank us for introducing you to this fabulous footwear! At first I was a little nervous when I saw the Mox. The rubber is soft, but I was sure that it was going to cut into my feet and be uncomfortable or rub a blister. I could have not been more wrong! The first time I wore them I put them to the test. The kids and I had a ton of errands to do, and I was on my feet all day. Not once did I even think, "Oh gosh, my feet hurt." In fact, it was just the opposite. I was astonished at just how comfortable they were after such a long day. I've worn them on rainy days (because we've had A LOT of rain here lately), and the material is perfect for rain. Especially when it is still so warm outside when it rains. My feet always get so hot in my rain boots, so the Mox shoes were excellent in keeping me from slipping everywhere, but still comfortable. 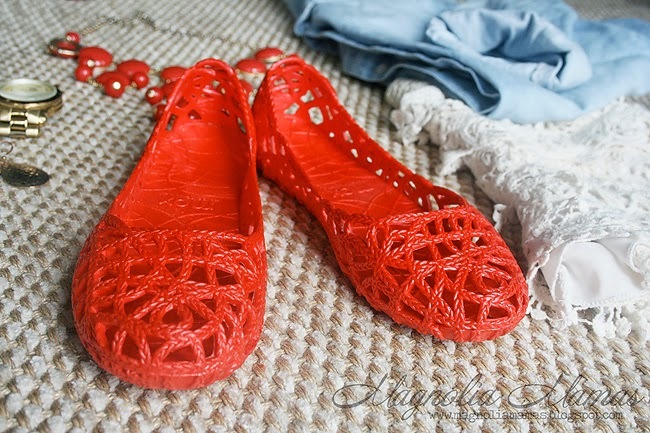 I would highly recommend these fun ballet flats, and I can't wait to order another color. I am leaning towards the navy for summer. The team at Mox wants to spread the word about how wonderful their shoes are, so to help do that they are partnering with us to give our readers a special discount code. When you checkout use the code Magnoliamamas10 to receive 10% off your order. How awesome is that?!?! (Code will expire on May 23, 2015.) Be sure to check out Mox Shoes online HERE to see all of the color options and sizing guide. Right now they are also offering free shipping on all orders in the USA so it's a perfect time to give Mox Shoes a try! You can also connect with them on Instagram, Facebook and Pinterest. OH how cute! I should definitely give them a try. 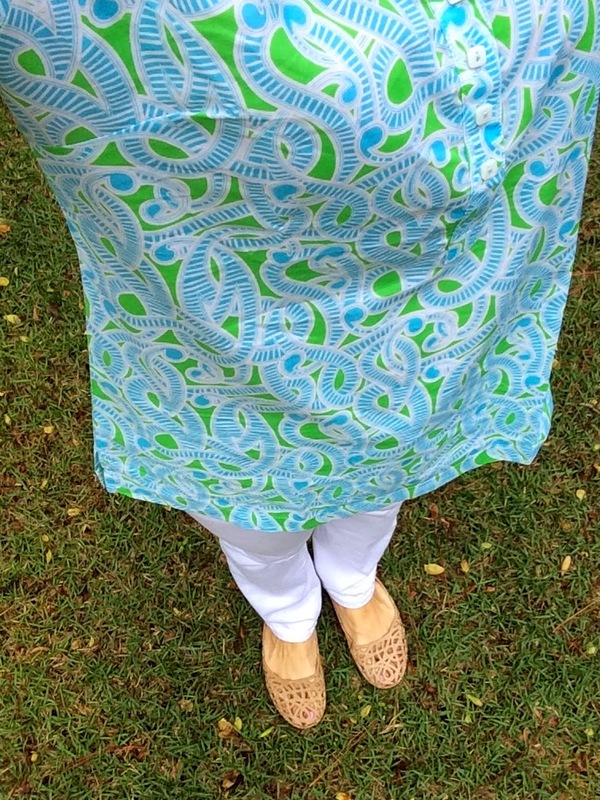 I'm like Carrie Beth - I love flats but rarely find them comfortable. Will have to check them out! I LOVE these! They look so comfy, but so stylish as well. Like, Carrie Beth, I've found it very hard to find flats that are comfortable enough for me, but these might be an exception. I'm on my way to the site to investigate some more. Thank you so much for sharing. You're welcome! Let us know if you have any other questions about sizing, etc. I got my Mox a few weeks ago and absolutely love them. They are so comfortable and so cute. I recently took them on a weekend getaway with my husband and literally wore them to the beach in the morning, the pool in the afternoon and to dinner at the resort that night. Yea!!! So glad to hear you love your Mox, too! That is one thing we love most...the versatility and how they can literally take you anywhere! I am obsessed with my Mox!!! I have four out of the five colors and wear a pair every day. I love the blueberry with blue jeans and the latte with all things summery. And the platinum and coral cover everything else! I always get compliments on my Mox and my girlfriends have started ordering them and are loving them as well! How fun! I am excited to get another pair. I think the blueberry might be next on my list. Have you seen the Austrailian colors? I am hoping they incorporate some of those colors as well into their US line. So fun! http://yummomummo.blogspot.in/2015/04/yummomummo-meets-mox-shoes-usa.html if you feel like having a read. Glad you like them too, I have a feeling we will be seeing these stylish shoes on every fashionista this summer! Your blog site is awesome!